My son was Darth Vader for Halloween and I told him with zero irony that when I was his age I would have killed another child for a costume as realistic as his. My first day of kindergarten I wore brown Darth Vader Stride Rites. It was 1980 and for some reason our Stride Rite store featured a man with a pet monkey who played the accordion. Other than the monkey I don’t remember much about buying those shoes except they were in the boy section and they must have been ugly enough for my mother to protest as she has referred to them many times over the years as “those ugly brown Darth Vader shoes.” But I loved them so much I refused to take them off in the store so she gave in, an early indicator that she was always willing to let me be me, dumb looking shoes and all. 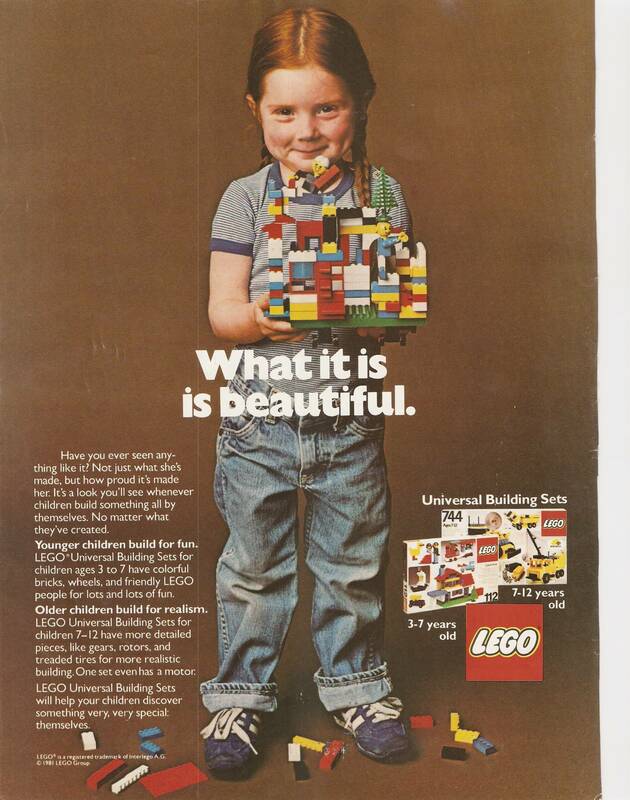 There’s a Lego ad from the ’70s that frequently pops up on Facebook of a little red haired girl with a stack of primary colored bricks, the captions accompanying it always along the lines of “Remember when toys could be for girls AND boys? Remember when everything wasn’t so pink or blue and gendered?” I love that ad but that’s not the how I remember the 70s and 80s. In my memory, dolls were for girls and cars and guns were for boys. Full stop. Which made it really uncomfortable for a girl who just really wanted to play with the cars and the guns. My parents encouraged me to play with whatever I wanted to play with, they never cared at all, but I will never shake the feeling that my choices were somehow subversive, that to everyone else my preferences were different and notable. I can’t stand the word “tomboy” because that was the word I always heard, always deployed with a nodding head as if in justification of my oddness, it grated then and it still does. I. Am. Not. A. Boy. I remember thinking then as I still do now: Why is there a special name for what I like? And why do boys get all the good stuff? It seemed wholly unfair. Our categories then were so narrow. I was freshly married when The Phantom Menace was released. Nineteen years removed from my Darth Vader Stride Rites I stood in line with the other nerds so I could get tickets to the very first showing. I owed it to the little kid me who had hung upside down on the sofa for countless hours, Luke in the Wampa cave desperately trying to summon my light saber using the force. I remembered one long ago Saturday afternoon anxiously waiting for Star Wars to come on the tiny black and white TV my parents let me keep in my room at the end of my bed. I had just learned how to read Roman numerals and when the beginning words scrolled up the screen and I read “Episode IV, A New Hope” I ran through the house shouting for my mom, “There’s three more we haven’t seen yet! Star Wars is NUMBER FOUR! We have to find the first three!” I thought we could just go get them. I didn’t realize I’d have to wait until I was a grownup. And I was underwhelmed with those first three even though I stood in line early for every single one, and gave lip service that they were “good” out of respect for a world that had meant so much to me as a child. But the grownup me, the freshly minted mother of a daughter me, was suddenly able to look back at it all with a new set of eyes. Where are the women? I thought. I mean, yeah, there’s Leia but seriously, how could they treat Leia like that? The slave bikini? When from the very first movie she was the only one who knew what was going on, her heart and her mind had never failed to save them all. Leia was always the hero, but she never got to be the hero. Still though, I understood. It was a different time and we have evolved some from those days of the ’70s and ’80s when women were only the eye candy or the prize. But in the 21st century, Queen Amidala somehow had less agency than Leia had decades before, which made me not care anymore. I was done. I didn’t bother sharing Star Wars with my kids because suddenly I realized I had been left out. I had always forced myself into a world that didn’t seem to have a need for me. Like a jilted ex-lover, for years I had looked for news of an episode VII from the dark corner of the room, paying attention while not admitting I was paying attention, sure that I was just going to be disappointed again. When the first casting announcements broke I ranted angrily on social media because again it was just white dudes. My love for Luke and Han not withstanding, this time I was gonna need more. 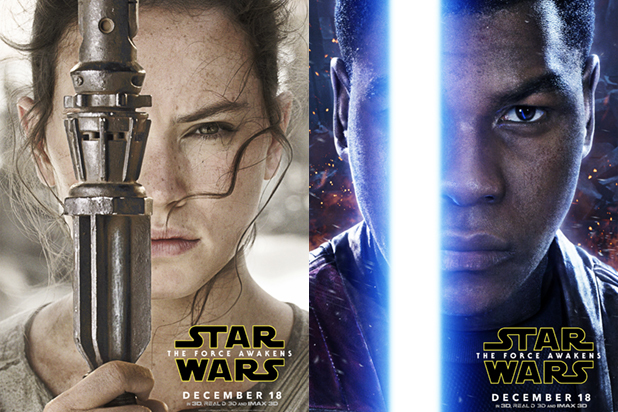 But then we did hear more and there was John Boyega. And then Daisy Ridley. And Lupita Nyong’o. And Gwendoline Christie. There are people of color and there are women—women in the posters and in the trailer and they look important, like maybe at least one will be the hero, a hero that every person will happily and fully acknowledge is the hero. There are light sabers all over my house now. My son was Darth Vader for Halloween and I told him with zero irony that when I was his age I would have killed another child for a costume as realistic as his. I’m sure he knew that was a powerful message, but I can feel its meaning in my bones. I know that on December 17th at 7:30 at the very first showing of A Force Awakens in my town, I will be there with my kids and I will bawl the whole time. I will bawl with joy for the children now who get to love what they love freely, I will bawl with joy for the children who get to see themselves in Finn, I will bawl for the children who will see themselves in Rey, as the hero at long last, and I will bawl with joy knowing how much it would mean to the 8-year-old me. Jenny Poore writes about parenting, public education, and politics. Her work has most recently appeared in xoJane, Mommyish, and Full Grown People. You can follow her on Twitter @Jenny_Poore and at her blog, Sometimes There are Stories Here.